Holthinrichs Watches is working with a Renishaw Additive Manufacturing Solutions Centre to build up knowledge about the potential of metal additive manufacturing (AM) and to speed up the overall manufacturing process for high-end, limited-edition watches. Michiel Holthinrichs, the founder of Holthinrichs Watches, is working with a Renishaw Additive Manufacturing Solutions Centre to build up his knowledge about the potential of metal additive manufacturing (AM) and to speed up the overall manufacturing process for his high-end, limited-edition watches. His first design ‘Ornament 1' combines traditional watchmaking elements, including a Swiss movement with manual winding and a design inspired by classic watches of the 1950s, with the new technology of metal 3D printing, which was used to produce the case, crown and buckle. Holthinrichs Watches was founded by Michiel Holthinrichs in 2013. Whilst studying for a Masters in Architecture at Delft University of Technology, he began to collect and repair vintage watches. Architecture had taught him the importance of detail and ornamental features, which are ubiquitous in art deco, and he recognised these elements in watch design. Michiel viewed the elegant time pieces as miniature, precise constructions and this inspired him to transfer his artistic and engineering skill into creating his own watch design. Michiel produced his first design iterations traditionally with pencil sketches, developing them into hand-drawn technical drawings and taking into consideration that the parts would be produced using CNC machinery, or on a manual lathe. However, he did not have the machinery or skills to produce them himself, so he needed to find a manufacturing partner. This proved to be more difficult than anticipated because the Netherlands does not have an established watchmaking industry. Michiel had read reports in the media about 3D printing and discovered that Renishaw manufactures metal AM systems. He contacted Phillippe Reinders-Folmer, General Manager of Renishaw Benelux, who suggested Michiel begin his journey into AM with a reputable 3D printing bureau in Belgium that had recently installed a Renishaw AM250 system. Michiel worked with the bureau to 3D print prototypes and the first ‘Ornament 1' watch on its Renishaw AM250. The case, crown and buckle of the ‘Ornament 1' were metal 3D printed in stainless steel 316L. The watch case has a diameter of 38 mm and is only 10 mm thick; it has a raised inscription of the Holthinrichs brand on its edge with the words ‘stainless steel', ‘3D printed case' and ‘Swiss movement', in capitals on its reverse. These details were achievable only by using metal AM. The batch of watches took approximately thirty hours to print on the Renishaw AM250 system. Post-processing, including machining of the parts, was out-sourced and they were returned to Michiel, who finished them with hand filing and polishing. The post-processing, assembly and adjustment by hand took a further thirty hours per watch. When ‘Ornament 1' was formally launched, it attracted publicity due to the novel use of 3D printing technology. The elegant 1950s art deco design and beautiful presentation combined with a limited-edition run justified its added value price of over €3,000. Michiel noted, however, that customers seemed to be less concerned by the method of manufacture, but rather more by the details in the design which are not offered by other watches. The Holthinrich's signature which appears as raised fine script on the edge of the case could not be achieved by traditional manufacturing and highlights the capability of Renishaw's high-performance AM systems to produce highly precise and fine detail features. Now that Michiel has proved ‘Ornament 1' can be produced, he wants to investigate how reproducible it is and to streamline the labour-intensive finishing process. In addition, his manufacturing costs were relatively high because the metal 3D printing, machining and other automated post-processing all had to be outsourced. He did not have the necessary skills to take these processes in-house, nor was he at a stage where he felt he could make an informed decision about new investments. Michiel can see the potential for increasing his range, noting “The whole watch industry is changing; there used to be big companies which run on tradition [...] but I think people overall – not just in the watch market – but across a broader scale of products, are moving towards a more personal, more authentic product”. 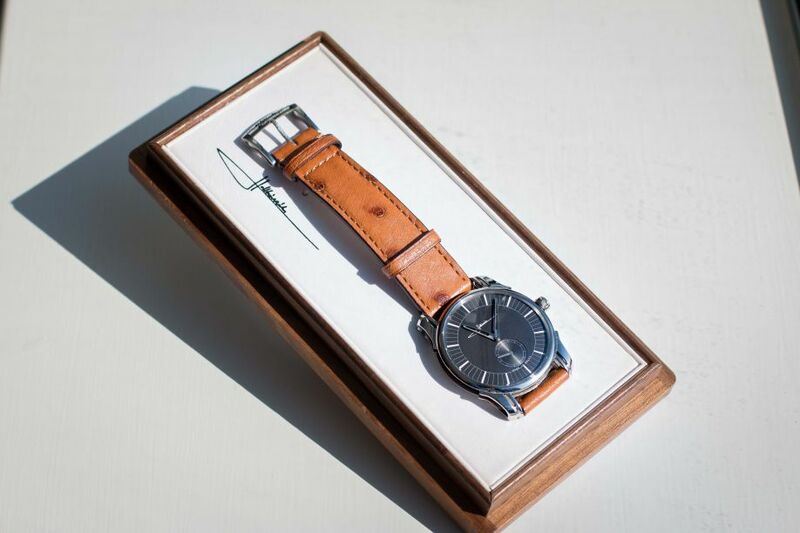 His plan is to develop a core range of classic style watches that are high-end and have a strong element of personality, but which could be completely customised like bespoke jewellery. After an evaluation by Renishaw it was concluded that a Renishaw Additive Manufacturing Solutions Centre (AMSC) would be the best way to take Michiel forward on his journey in metal AM production. Located globally, Renishaw Additive Manufacturing Solutions Centres are places where customers can rent time with Renishaw AM technology, supported by Renishaw engineers. Services at an AMSC can cover the full production process from design for AM through to finishing and inspection. Customers have access to technologies complementary to AM, including machining and metrology. The aim is to allow customers to build up their knowledge in less than six months so they may make a fully informed decision about the potential of the technology and process for their business, before they take metal additive manufacturing in-house. “We make the machines and we use them. With that experience we can help companies progress further with advanced manufacturing systems”, explained Philippe. Based on the success of the ‘Ornament 1' in stainless steel, Michiel wished to offer the watch design in an alternative material. Renishaw recommended titanium because it is possible to achieve a highly polished finish and it is suitable for investigating chemical post processing which could help reduce finishing time. Also, titanium is lighter than stainless steel and this would provide Michiel with an additional point of differentiation in his ‘Ornament 1' design range. One of the key benefits of metal 3D printing is that no tooling is required and the design is drawn up in 3D CAD (computer aided design) software. “If Michiel wants to tweak a design, or change an engraving or a signature he can do that on his computer and there's no knock-on effects further down the process line”, explained Charlie Birkett, a Renishaw AM Applications Engineer who supports customers in the UK AMSC. Renishaw exported Michiel's new design into its QuantAM build preparation software. QuantAM was developed specifically for use with Renishaw metal AM systems. Using this software, the Renishaw team could show Michiel how to check and configure the parts on the build plate and apply the necessary supports. The team's know-how ensures that the minimum number of supports are applied to avoid waste and save time. Once the build was prepared in QuantAM, the file was sent to a Renishaw AM 400 metal AM system. This system was chosen due to its flexibility in terms of material changeover and ability to reproduce sharp corners and the fine detail in the design. Continuing this journey into AM, Renishaw and Michiel will now investigate several manufacturing and post-processing solutions to improve his production time ensuring all the while that the parts are of the highest quality.